i had several calls about a tiny dog all dressed up in a dress with frills that was on hte ship-- the dress and frills does not eliminate a dog from serv dog work-- many tiny dogs are perfect at alerting deaf people to sounds,,,, in dresses or not... i certainly would hate to hear someone put one of our dogs in a frilly dress (at least while working?) but asher wearing a hat and tie for formal affairs seems very approp[priate..
i am also on shatting day, calendar shot aT 6:30AM - AND I FORGOT THE REST. We had another nice lemonade stand and have two more the next 2 weeks in a row. This week was a little slower but a very nice gentleman handed Eve a $100 bill!! The girls thought that was pretty cool. Since Eve is down to one 1 good arm she was the ‘goodwill ambassador’ it was nice because since she wasn’t busy with money or lemonade people had the opportunity to chat with her and she got to tell more people all about SDP and handed out your pamphlets!! Recently I attended the US Open, since this golf tournament was held near our home on Long Island. Truthfully, I am not a fan of golf (nor is Mom), but Dad really enjoys this sport, so we figured “if you can’t beat ‘em, join ‘em” — at least for 1 day. In the morning, Dad drove us to the remote parking. We all had to go through security. Mom and I walked through the detector, and of course the alarm sounded, probably because of my “necklace” (aka, the chain on my leash). A man waved a wand over Mom, then toward me. This was a new experience for me. I have to admit that I am concerned about anything close to me while I am with Mom, because I do not want to be distracted. Of course I let him check me out with the wand, but was then happy to get back to helping Mom. Once cleared, we walked on to wait for the bus. The space on the bus was cozy, but we managed. As we exited the bus, it started sprinkling. Honestly, I preferred cooler wet weather to the blazing sun, since I can get warm quite quickly because of my mostly black fur coat. We began walking as it continued to drizzle. We approached a concession stand and all of the teenagers working there were very excited to see me, with a few waving hello and calling out to us. Mom and Dad stopped for a drink and told them about my training, the Farm, and the puppy cameras, as Mom handed out my “business cards” with the Explore site & SDP website on them. What a wonderful welcome to the event!! I have to admit that although I was just doing what I was trained to do, it is fun to hear compliments about how helpful & pretty I am. We walked around the course, and it was beautiful. Even though I don’t care much for golf, I appreciated the undulating hills, and thick grass of varying heights (Dad said he knows this tall grass well, since he spends a lot of time in it, looking for his ball. Lol). Although I was in vest, I had fleeting thoughts of rolling around on the perfectly manicured greens...and when the humans found a spot to stand and watch, Mom laid down my bug-repellant blanket and I had a nap. I dreamed of running zoomies on the fairways...but of course, I am a professional, so I only *dreamed* of running & rolling around on the golf course. At one point, I heard something about a tiger, so I stood up to try to get a glimpse of this magnificent cat, since I have never seen one before. Much to my disappointment, people seemed so interested as just another golfer walked by, this time flanked by police officers. This man definitely didn’t look like a tiger!! After that, I settled down on my blanket again, since apparently nothing too interesting was going to happen. Boredom definitely achieved. It was a little unusual to be the only dog at the event, but I am used to this in my line of work. Sometimes, Uncle Jeff hung back behind us. He said that he enjoyed listening to people as we walked ahead of him. 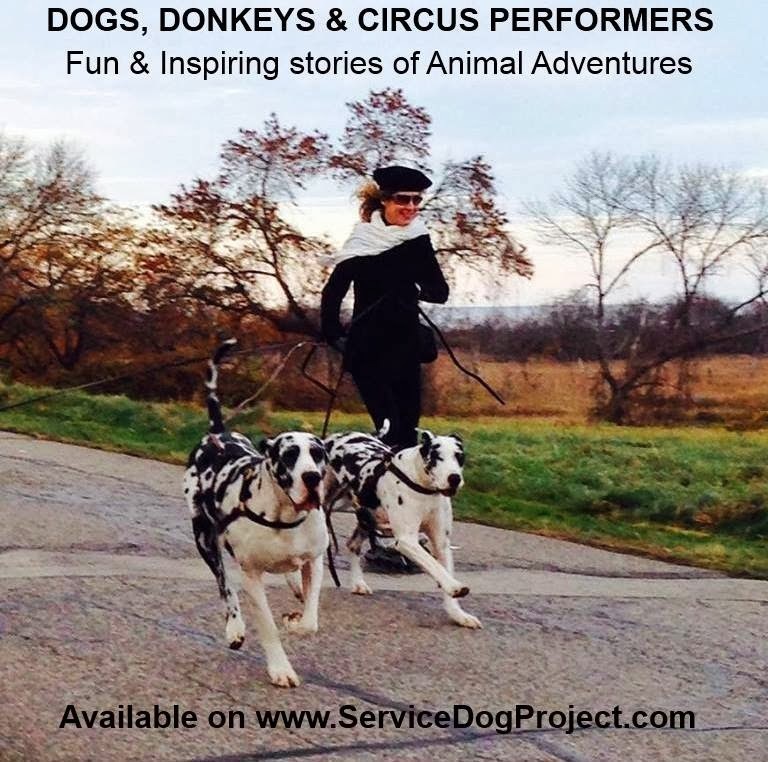 Apparently the most common comment was some version of the horse/ride her/put a saddle on her (which we still try to smile about politely, since those who say it must mean well, and we try to be good ambassadors for Service Dogs & SDP). I think Uncle Jeff said the next most common was about my size. Yes, I am a big girl at 140 pounds, but Mom always explains that this helps me to do my job, since I support her weight when walking, or doing stairs and such (and the vet said that I looked “perfect” at my appointment last month, so I am not too big)...perhaps the most interesting comment came from a man waiting next to us at a fairway crossing. “Let me guess — she is a small poodle?” We all chuckled at his humor and the humans had a nice conversation. Most people asked before trying to pet me. Mom used to say something like, “no, not while she is working.” But lately Mom and I have been working together on how to better deal with this. See, when people try to pet me while I am working, I often back away a bit, usually just by moving by head just enough to signal that I’m not interested in pats from them (of course, without moving so much that I get Mom off-balance). So now Mom often replies by saying, “No, she probably won’t let you pet her while she is working — she is that much of a professional.” We have learned that this often leads to an excellent opportunity to then educate about Service Dogs and my training, so that the people are less disappointed about being unable to pet me, because they better appreciate my work. There was not much else notable about the day, just more walking and resting. By the end, Mom was exhausted, but so proud of us. Dad was also surprised at how much we were able to do together. As we were walking toward the bus, Mom and Dad both called me “SuperGirl” several times, and I was extra proud of our teamwork, too — all 3 of us had a great adventure together.